America truly became my home when it gave me the opportunity to educate myself — when it gave me an opportunity to strive for what I love. My culture and background will always be tied to Mexico, but America will always be my home. Nobody in my family has a degree and I want to be the first to get one. When I do, I will have achieved it not only for myself, but for my mom who has supported me through everything. 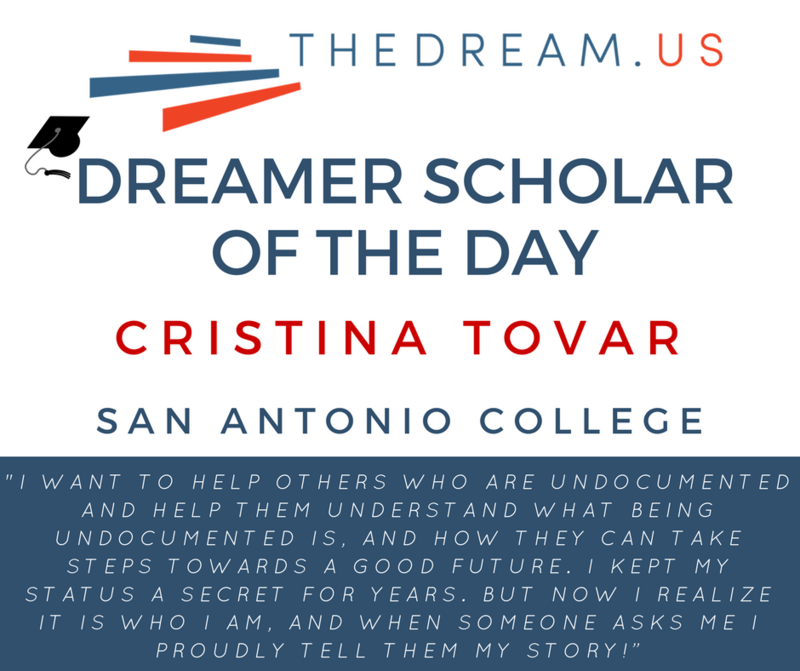 I came across the TheDream.US scholarship while researching for financial assistance for undocumented students. I’m currently working two jobs to help with expenses for my family and myself, so gaining this scholarship has gave me an opportunity to study without worrying financially. I didn’t realize I was undocumented until I was in the sixth grade. Teachers looked at me differently and asked me questions that they didn’t ask others, which got me wondering about who I am, where I came from, and what made me different. Then I found out I was undocumented. The most influential people on my journey so far are my mentors back in high school and my mom, and now I want to help others who are undocumented and help them understand what being undocumented is, and how they can take steps towards a good future. I kept my status a secret for years. But now I realize it is who I am, and when someone asks me I proudly tell them my story! Growing up in America was hard at first. I did not know English, and because of the language barrier I ended up having to repeat Kindergarten. I had to learn the nuances of an entirely different culture. However, as the years passed I started to grow into the American ways and establish myself in my community. Then things started to get harder again. My dad was an alcoholic so my mom left him. I was only in the 5th grade and it was difficult to not have both parents around, especially since my mom had to work multiple jobs to support five kids on her own. I struggled personally in high school since I was undocumented, but I pushed myself hard and graduated in the top 3% of my class, ranked number 6 with a 4.0 GPA. I was a member of the National Honor Society for two years and the Spanish Honor Society for all four years of high school. My senior year I was the President of the Spanish Honor Society and the Vice-President of the Texas Association for Future Educators. Outside of school, I played guitar, sang in the choir at church, and played club soccer. And at the age of 15 I also started to work in order to help my mom out with the bills. Juggling school and work made me appreciate everything my mom did for my siblings and me. I started to love school, knowing that with it, I could help change my family’s life. I have just started my first year in college. I’m studying education and plan to be a bilingual elementary teacher so I can help kids know what they want to be when they grow up. I will tell my students to strive for what they believe in. There might be obstacles along the way, but together, and with perseverance, we can rise above them.